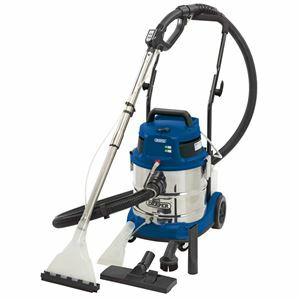 Draper 3 in 1 Cylinder Vacuum and Carpet Cleaner - 3 in 1 vacuum cleaner ideal for the home, workshop, office and garage environments and especially useful for car valeting. Featuring a variable suction switch and spray facility for valeting carpets, floors, upholstery and hard surfaces. The detergent is added in the form of a pressurized spray. This cleaner is also designed to pick up dry material. It has a 20L tank and 4L detergent capacity. Fitted with 10M (approx.) cable and approved plug.